That is such a cool looking amp. Yeah, upright bass is often very hard to hear yourself, especially on a small stage, so the upward firing speakers are a god-send. It's not a terribly loud amp, and I don't need it to be, but they make a 300watt model with four forward and two upwards speakers. I may investigate that down the track a bit. Cool looking amp Marty. Do you have any issues with feedback? Cool looking amp Marty. Do you have any issues with feedback? Or should I say... how loud can you play before it becomes an issue? 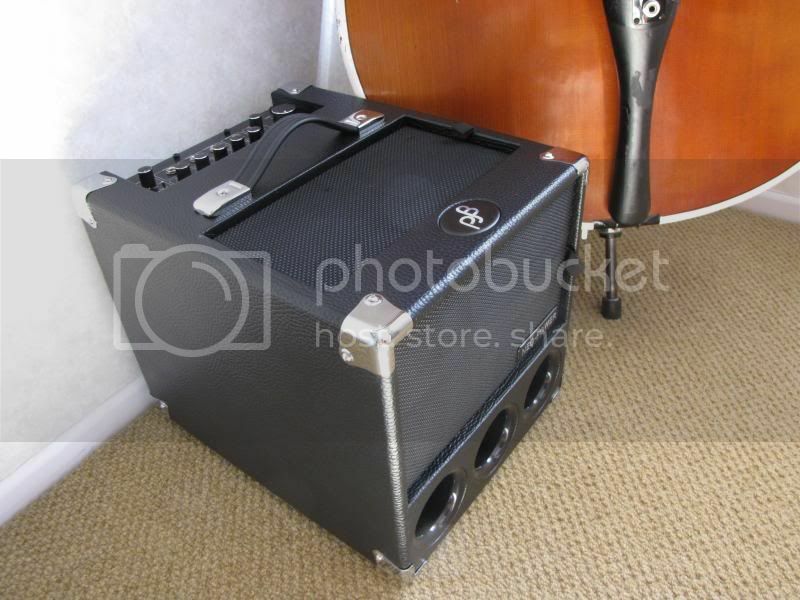 beagle wrote: Cool looking amp Marty. Do you have any issues with feedback? Or should I say... how loud can you play before it becomes an issue? When I was in the rockabilly band, we did some gigs that were pretty damn loud. I can control it with technique and judicious use or lack thereof of the bass knob. That problem doesn't exist for me now as I flat out refuse to play loud gigs any more. Fortunately the bands I play in now dont get that loud. There's only one outfit in NZ that sells them, Pete McGregor Bass in Auckland, who is an upright specialist. PJB amps have some amazing revues, and a high profile user was Bob Babbitt. I used to own a crwam coloured PJ Briefcase-it was awesome. Perfect for EUB and rehearsals. I did the research and came within cooee of grabbing one of these a few months ago. I did the research and Pete McGregor was very friendly. They are certainly highly rated overseas. In the end the only reason I did not get one was Jansen offered me a 250 watt Markbass Minimark 2x6 at a silly price because they were going out of them. I think if I played upright I would still have gone for the PJB, but I am very happy with the Minimark with my electric basses for practice and quiet/acoustic work. Pic of my rig, now with 400watts and ten 5" neo speakers. This setup has so much bottom end I'm rolling off the lo-bass knob to 9 o'clock, and great top end thanks to the lack of stupid piezo tweeters. I'm lovin' it. I see no rig in the link my friend ? and 10 speakers gtfoh ! Link does not provide a pic for me either, but sounds like you have gone for the expanded PJB setup, Marty - it has always intrigued me. I rather wish I had gone the PJB way myself now for a small rig - my Markbass Minimark combo bit the dust last week (it was only ever used for quiet practice) and Jansen have just told me the repair will take some time as any parts have to come from Italy. So much for a quick warranty service on an item that is under three months old . Serves me right for buying with my wallet rather than my head. Still delighted with the recently purchased Orange AD200 head though - I used to have one and always regretted selling it. This one will be staying on . I've only borrowed Tony's but love it for the P Bass w Flatwounds routine. Snap there, Foal. My favourite bass with tne Orange is a Custom Shop P with TI flats and into a 215 cab. Low end heaven.